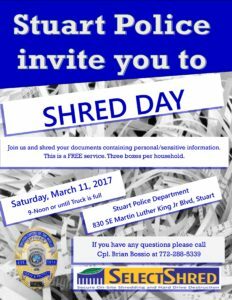 Stuart Police Department and SelectShred will host a free shred event from 9:00am to Noon (or until the truck is full) on March 11, 2017 at the Police Department, 830 SE Martin Luther King Jr Blvd, Stuart FL. Three boxes of paper documents only are allowed to be shredded per household. Large metal objects, plastics, batteries, etc. will not be not accepted. Only paper will be accepted. Please contact Cpl. Brian Bossio at 772.288.5339 for additional information.